Funeral day underlined what we already knew….that there will never, ever, be another Bill Slater. In a leafy corner of West London yesterday, though, we learned that there was much more to the story beyond the glorious statistics represented by his winning of three League Championships, one FA Cup, 12 England caps, 21 amateur international caps, the Footballer of the Year trophy, a CBE and an OBE. It wasn’t just what Bill won and achieved that counted. It was how he did it – as an utter gentleman. This scholar, Olympian and last great amateur of the English game, a much-loved dad and doting grandfather to boot, was truly Corinthian in his values. Never, with the exception of Sir Jack Hayward, have I known so many quirky, fascinating morsels to be attached to a member of the Wolverhampton Wanderers family. And, unlike the revered former owner and chairman, he could not be said to have had a privileged start in life. William John Slater was bright enough to attend Clitheroe Grammar School but had it tough at the outset of a journey that made him an outstanding educationalist. Partly because of his father’s poor health, the family were impoverished – Mum was a mill worker and Bill’s only sibling, Edwin, was born physically disabled. Bill wore wooden clogs on the two-mile walk to school from the village of Waddington, his shoes being reserved as Sunday best. His first pair of football boots were so over-sized that they had to be stuffed with newspaper. It’s ironic that the man who would become a university lecturer was sent out into the world without further education – another pay packet was essential. He secured employment at 16 in the local Williams & Glyn Bank, adhering to his father’s orders to make sure he had an ironed white shirt for his first day – and then being sent home by the manager for not wearing a tie. The family decamped for a while to Blackpool in the hope that regular gulps of coastal air would aid his father’s well-being and it was there that the seeds for a quite magnificent football career were sewn in strange circumstances. Young Slater was also an excellent cricketer – good enough to later play for Warwickshire seconds – and it was only when rain washed out play one Saturday in the middle of the war that the nearby Seasiders asked if they could have him for the afternoon instead. 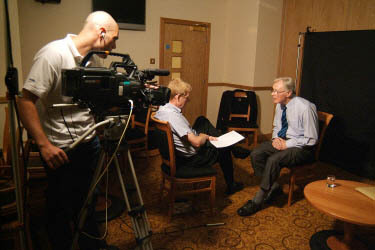 Bill Slater being interviewed at Molineux by David Instone more than a decade ago for the Wolves Official History dvd. 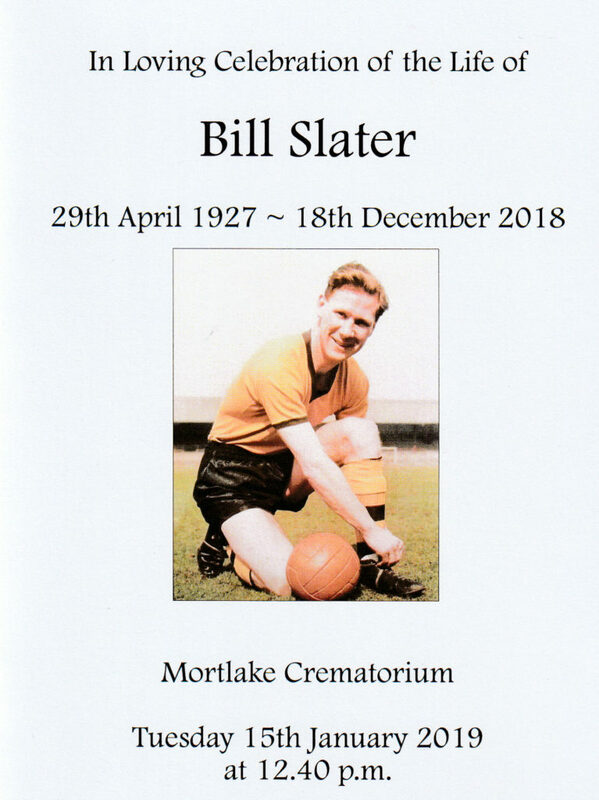 We recalled in our obituary on December 21 that Slater had had to ask permission from his principal at Leeds University to play for Blackpool in their 1951 FA Cup final defeat against Newcastle. It was granted only on condition that he was back on campus that night. That Wembley outing was an unhappy one. Virtually his only fond memory of the day, other than being introduced before kick-off to King George VI, was how his team-mates kindly formed a screen while he changed his torn shorts in front of what otherwise would have been 100,000 sets of eyes. Bill once made Blackpool history with an 11-second goal that was the fastest they had ever scored but he struggled to make his name in the literal sense. The line-up in match programmes often reflected his amateur status by calling him WJ Slater. Full, admiring recognition came later. Sixty-four years ago yesterday, in a position with which Wolves fans more closely associate him, Slater played alongside Billy Wright and Ron Flowers in a 2-0 Wolves win at Blackpool, but his career path might have been different. His arrival at Molineux followed his appointment to a full-time post at Birmingham Uni and was a step up from a brief spell at Brentford, just two or three miles from where we congregated for the lunchtime service at Mortlake Crematorium. Already, his sense of fair play was apparent. When he captained the Great Britain team in their unsuccessful tilt at the 1952 Olympics in Helsinki, the coach told him he wanted players to stand over the ball at opposing free-kicks to prevent them being taken quickly. “Not in my side, they won’t,” he piped up. He also revealed in a subsequent magazine article that he worried for a while that his Wolves team-mates would see him – someone making a decent living outside the game – as taking the bread from their mouths if he played in their place; another indication of his decency. In short, he just wanted to play because he loved the game so much. He struggled to understand why so many chose to watch. Bill Slater as he is best remembered. 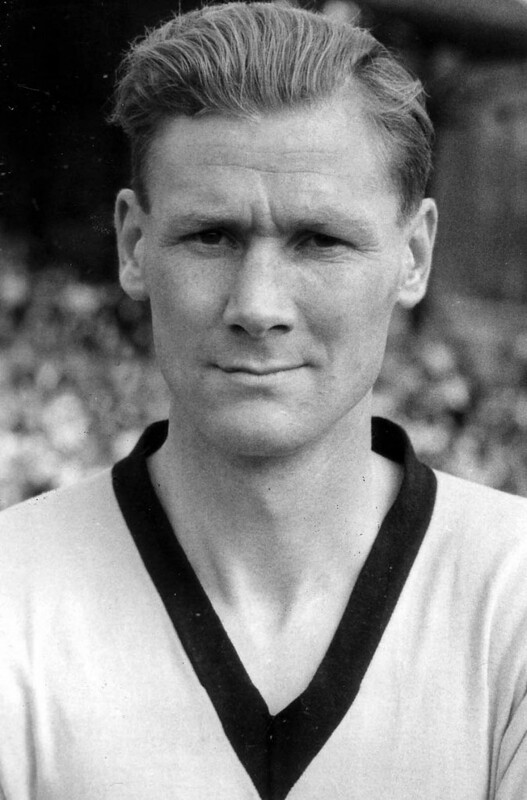 He soon nailed down a spot in Wolves’ first team, playing 40 games as the League crown came to Molineux in 1953-54 for the first time. His teaching duties meant he had to miss the midweek Charity Shield clash five months later with the Albion side Wolves had beaten to the title. Alas, he found himself in a near-empty classroom because, while he had put academic requirements first, many of his students had found the temptation of the 4-4 Molineux draw to be too much to resist. His unusual arrangements meant he sometimes travelled separately from the team and son Tim informed us that a Wolves-supporting corporation bus driver left other passengers bewildered on one occasion when taking a detour past Molineux just to ensure Bill was there for kick-off. That spared the lecturer a lecture from Stan Cullis, who showed his compassion by having Slater round for a turkey dinner one year when wife Marion, who he married in 1952, was in hospital for Christmas. He certainly looked value for money in the film of the 1960 FA Cup final that was playing in the background at yesterday’s wake. The sight of him raising the silverware, modestly and in an understated way, brought some clapping in the room. Slater was also honoured with applause – a minute of it – before last week’s FA Cup victory over Liverpool and the tribute stretched across several pages at the front of the programme, including the brilliant front-cover painting that artist Louise Cobbold presented to his family. We can only guess what he would have made of the wages commanded today by the players who stood solemnly in line. A playing contract shortly to be returned to the Molineux museum shows his pay in 1961 to have been £22 a week, plus £3 a game appearance money and a £100 incentive to reach the FA Cup final. 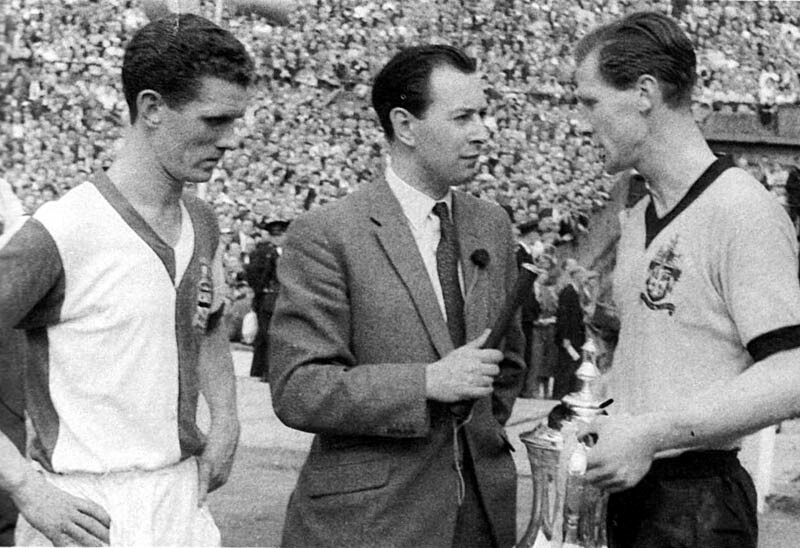 Bill with David Coleman and Blackburn skipper Ronnie Clayton at Wolves’ 1960 FA Cup final victory. From another son, Jonathan, came an insight into how the good living that Slater made was transferred into luxuries. Or, rather, how it wasn’t transferred. Such was his habit of driving decaying, clapped-out cars that one Austin Maxi had its roof held up by an old cricket bat and an ancient Ford Cortina was once pinched from outside their house because it only started if the keys were always left in it. Hilariously, and in true Only Fools and Horses style, it was stolen as a getaway car, the four bemused occupants later being arrested by police as they sat in dejection after ransacking a stately home. The Reverend Frances Grant called Slater ‘one of those people who was born to thrive’. And, from the grandchildren, there were deeply touching tributes, Will, Louise and Jenny taking their turn at the front to use phrases such as ‘the kindest, sweetest man’, ‘relentlessly positive’ and ‘extremely thoughtful’. Her father’s connection to sport, which was highlighted by the presence yesterday of representatives from Birmingham University, Lilleshall Sports Centre and British Gymnastics, was further captured by the recollection of how he had tears in his eyes when once seeing Torville and Dean produce a foot-perfect routine. And this is perhaps where his feats become even more impressive. Among the countless managerial positions he held, such as deputy director at Crystal Palace National Sports Centre and chairman of the Sports Aid Foundation, he encouraged another to live her dream. When daughter Barbara missed out in 1973 on a place in the national junior gymnastics squad, he took it upon himself to use his own PE background to coach her instead. Photos from the family album….wedding day in 1952 (above) and (below) a family outing to the Palace. The only time they could have use of the floor at Birmingham Uni was late at night, so it became a familiar ritual for him to push the tables and chairs out of the way, so she could go through her routines from 10.30 until midnight or beyond. It was worth it – she was selected for the 1976 Olympics in Montreal. Bill Slater died on December 18 at the Wytham House care facility in Oxfordshire after suffering from Alzheimer’s disease. Three members of the home’s staff were among the mourners yesterday. Posted on: Wednesday, January 16th, 2019.